Lexington Technology Park is a 16 acre plot of city-owned land that will be up for sale this year. The Urban Redevelopment Authority, largely due to pressure from residents and community groups, will conducting a community process before issuing it a request for proposals (RFP) from developers. The site is located right next to the Homewood stop on the East Busway, a prime transit location, and unfortunately close to the development and gentrification of East Liberty. 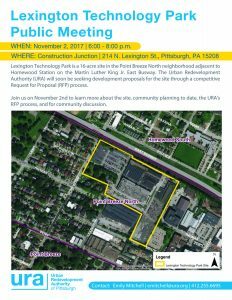 If there is not mandatory affordable housing included on this site, the communities of North Point Breeze and Homewood, both adjacent to it, will experience the same pressures and displacement that have changed the face of their neighboring East Liberty. Transit oriented development projects without regard for affordable housing will inevitably lead to gentrification and displacement. For more information about the housing and transit connection, click here. PPT, along with the Penn Plaza Support and Action Coalition, many members of the North Point Breeze Community Group, and other housing activists and residents throughout the city are advocating that the URA and the city demand a commitment to affordable housing from any developer wishing to purchase the site. UPDATE: The RFP for Lexington Technology Park has been issued.